A special greeting at Christmas time to express to you our sincere appreciation and loyalty. We are so thankful and extend to you our best wishes for a Happy and Healthy Holiday Season. As for the big kids, Chad is keeping busy with selling credit card merchant services. He is in the process of getting his real estate license and joining Kerry at Canoe Capital Realty. Tiffany is teaching 1st grade again this year. John is busy with his construction company and Taylor is at Winona State studying history. We (Kerry and Sandy) are planning a trip to Florida the first of December for a week. Then the show circuit will begin the end of January. The whole family traveled to Illinois for Thanksgiving and had a great time! The cabins are tucked away until next spring with more renovations to come in 2017. This coming season of 2017 will be White Iron Beach Resort’s 100th year of continuous operation. Hope you will be a part of our celebration throughout the 2017 season. We wish everyone safe travels and a Wonderful Holiday Season! Most of us have retired our soft water fishing gear for the current season. The weather has been plenty nice to get out on the water but we especially have been way to busy to get out there. The first ice will form before you know it and a whole new world of fishing will begin for more months than we have for open water angling. I would imagine the first walleyes will be taken on Shagawa sometime in November. We might have access to a really nice fish house this year so maybe we will have more personal ice fishing stories to report as the winter progresses. The BWCAW Lottery application period will be from Dec. 14, 2016 at 9 am through Jan. 11, 2017 at 9 pm CT. Entry points include: both paddle and motor overnight for #24 Fall L and #25 Moose L day use motor for D Fall L and Beyond, F Moose L. Newfound-Sucker, and G Moose-Prairie-Basswood. Lottery results will be available on Jan. 18, 2017. Reservations for all entry points may be made on first-come, first-served basis beginning January 25, 2017, 9 a.m. Central Time. Reservations are for dates from May 1 to September 30, 2017. It does not matter when during that time frame you input your request as it is a random draw for all that apply. If you want to pick up your permits at White Iron Beach please remember to request us on your applications. If you forget you can change this later. There are many more requests than permits for the Basswood entry points. If you want to give yourself a better chance for drawing a permit I would request multiple permits for the weeks you want permits. The permits are only $6.00 so if you get more than you want all you need to do is cancel the extra ones. It is important to cancel extra permits so others have an opportunity to pick them up. Go to Permit info to input you permit requests. 1600 E. Sheridan Street (Intersection of Hwy 169 & Hwy 1) (218) 365-6123 or (800) 777-7281 or www.ely.org. Winter Hours: Monday through Friday, 9 am to 5 pm – closed weekends – Summer Hours: Monday through Saturday, 9 am to 4 pm, Sundays, 10 am to 1 pm. 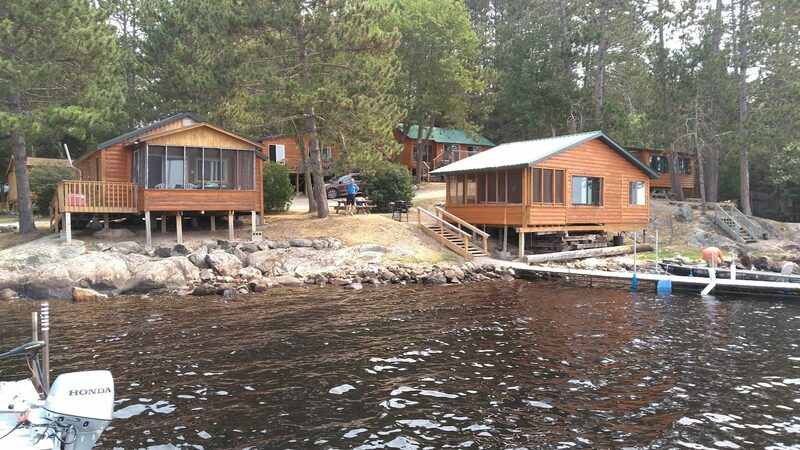 This cabin, once located on Basswood Lake, was built in 1938 by Finnish Lumberjacks. Using an axe, they shaped and fitted the logs. The winter of 1975 & 1976 the cabin was dismantled log by log, moved over ice and rebuilt at the present location. For the most up to date listing of activities, please check out our Event Calendar at www.ely.org. From the Chamber of Commerce: ½ mile East of Ely on Hwy 169 (218) 365-7600. Hours: May 1 thru Sept. 30, 8 am to 4:30 pm daily. Oct 1 to April 30- 8:00 am to 4:30 pm M-F – BWCAW Permits are issued here. You will also find a beautiful interpretive center filled with information about hiking, camping, canoeing, biking, and backpacking in the forest; books and other publications; gift items and various displays. From the Chamber of Commerce: 1/4 Mile E. Hwy 169, on the right 218/365-4451. Hours: Memorial Day to Labor Day Weekend, open Monday – Sunday, 10am – 5:00pm,; September 12 – 25th Saturday & Sundays 10am-5pm. ; October –Saturdays 10 am to 5 pm. Check out www.rootbeerlady.com for more details. Best known as the Root Beer Lady or Lady of the Wilderness, Dorothy Molter (also a registered nurse) was the last of a special breed of people, and the last legal resident of the Boundary Waters Canoe Wilderness Area. She believed in herself, even in the harshest conditions and facing great challenges. She lived in harmony with the environment. Adults $6.50; Seniors (62+) $6.00; Youth (6-17) $4.50. From the Chamber of Commerce: ½ mile East on Hwy 169, on the right (218) 365-4695 or 1-800-ELY-WOLF (359-9653). May 16 – June 12 open Sunday-Friday 10-5 and Saturday 9-5. June 13 – August 12-Open Daily, 9am-6pm; August 13 – October 16- Open Daily, 10am-5pm, Saturday 9 am – 5 pm. October 17-December 31 open Friday 10-5, Saturday 9-5 & Sunday 10-2. January 1-May 15 open Friday 10-5, Saturday 9-5 & Sunday 10-2. Check out www.wolf.org for additional details. The museum features ambassador gray wolves in their north woods habitat and a variety of exciting programs such as What’s For Dinner?, Wolf Communication and Family PACK activities. When you visit, don’t miss the award-winning films, Little Wolf children’s exhibit, daily presentations, and field trip. Two new rare arctic pups have joined the pack in 2016! Adults $12.00; Seniors (60+) $10.00; Children 4-12 $7.00. One mile west of Ely on Hwy 169 (218) 365-7879. May 1- May 26 Open Daily 10am-4 pm; May 27 – September 11 Open Daily 9am-6pm; Sept. 12- October 23, 10 am – 5 pm daily. Oct 24 – Oct 31 open Friday, Saturday 10am – 5 pm; November thru April 14 Closed; (groups of 15+ by appointment, call for rates). Facility features live bears in a 2 acre forested enclosure with a pond and 4 waterfalls. Observe bear thru windows or from the outdoor observation deck. Our newest bear, Tasha, a female yearling, has joined Ted, Holly, & Lucky this year. Adults/teens $12.00; Seniors (65+) $10.00; Children 3-12 $7.00. From the Chamber: Turn left on 169, go to the 2ND stop light, make a right and go 1 mile. Located at historic Pioneer Mine on Ely’s north side, the site is managed by Ely Greenstone Public Art (www.elygreenstone.org). The Shaft House, 401 North Pioneer Road, is open Memorial Day through Labor Day on Tuesdays from 2-5 pm, Fridays from 3 – 6 pm and by appointment (218-235-1721). Photos and artifacts from the underground mine which closed in 1967 are displayed. The Miners Dry House, 105 Miners Lake Landing Road, features events, art shows and classes throughout the year and is located alongside the Trezona Trail. New in summer of 2013, “Stains of Toil” to be shown during tour hours, the video recently published to YouTube featuring a montage of historic images set to original music and honors Ely’s underground iron miners from 1888 to 1967. Location: Vermilion Community College History of Ely including the Ojibwe (Chippewa) Indians, the Voyageurs who came here to trade furs, the development of the iron ore mining industry in the late 1800’s and the life of the men who labored in the underground mines, the logging industry which employed thousands of men in camps and mills, the role of women who came here in the early years. Video films on topics of local interest are shown upon request. Open June through August, M-F, Noon to 4 pm; Sept–May, Tu-F, noon to 4 pm. 1379 Stuntz Bay Road, (20 miles west of Ely on Hwy 169) (218) 300-7000. Memorial Day – end of September and weekends only in October through MEA weekend. Warm clothing & shoes are needed. A State Park Permit no longer required. Mine Tours – Memorial Day weekend, May 26 – Sept. 30, 10am-4pm, on the hour; Physics Lab Tour – daily at 10am AND 4pm. After Labor Day the weekday tours will run at 10am, 12pm, 2pm, and 4pm and the weekend tours will run hourly from 10am to 4 pm. The tour is approximately 90 minutes and is ADA accessible. After Labor Day the physics tour will run at noon only. The tour lasts approximately 1 1/4 hours. From the Chamber: Turn left on 169, go 4 blocks and follow historical marker sign at 13th Avenue East. Take a right turn and follow the signs 4 blocks to Pillow Rock on Main Street. Pillow Rock is an ellipsoidal greenstone outcrop of an age estimated at 2.7 billion years. The pillowed structure is characteristic of lava that solidified under water. Please note there is a sculpture in Whiteside Park also. Parties wishing to visit Sigurd Olson’s beloved Listening Point should contact Alanna Dore at (218) 365-8889 to schedule a tour. ELY FOLK SCHOOL Check out the full listing of courses available during your visit to Ely at www.elyfolkschool.org. Pickle Ball – Every Monday, Wednesday and Friday 9-11 am at the Vermilion Community College Gym. Free. Tuesday Group – Every Tuesday at the Grand Ely Lodge at Noon. Buy your own lunch. All are invited. No meetings from November 30 to January 9th. Dorothy Molter Museum – Visitors can do self-guided tours of the grounds at any time. Tour pamphlets are available outside of the store/main building. Visit the on-site nature trails. After season group tours by advance reservation. North American Bear Center – Onsite nature trails available year round. After season group tours by advance reservation. Pioneer Mine – Closed for season – Visitors can view outside exhibits. Also, hike the Trezona Trail to view self guided points of interest. Northern Grounds Grand Opening Event December 10, 2016 | 2:00 pm – 6:00 pm Join us as we celebrate the Grand Opening of Northern Grounds with a Ribbon Cutting Ceremony. Ribbon Cutting takes place at 2 pm. Come and sample wines at this great new shop from 2-6 pm. Ely Winter Fest February 2, 2017 – February 12, 2017 | All Day Ten days of winter fun in Ely. Snow carvings in the park, art in merchant windows, food, music, winter sports and many other events. Fun for the entire family. Don’t miss out on this spectacular annual event! Click on the “More Information” button below to access the event website. Fees: Most events are free – see website for details on specific events and fees. WolfTrack Classic Pre-Race Dinner February 25, 2017 | 4:00 pm – 7:30 pm Our pre-race lasagna dinner runs from 4 pm to 7 pm. Social hour 4-5 pm, dinner 5-6:30 pm, musher meeting from 6:30-7 pm and presentation of the bibs at 7 pm. Fee is $10.00/person at the door. Credit cards welcome.